You have to try this easy and delicious meal at home! Clean liver, remove membrane around the liver and cut into steaklets. I soak my liver in salt water for a little while. Pour some flour in a plate and season with salt, pepper and a little BBQ spice, enough to coat all the liver. Roll the liver in the flour making sure the liver steaklet are well coated. Heat a little oil in a pan, and fry all the liver until golden brown. Liver does not need to be properly cooked. Remove each piece of liver from pan once browned. Slice onions finely and fry in the same pan in the oil until nearly tender. 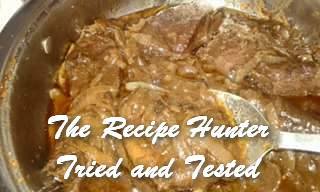 Return liver steaklets to pan and add a little water just to cover the liver. I add a little BBQ again. Close pan with a lid, and simmer on a low heat. Give it now and again a quick stir to make sure it does not stick and burn.